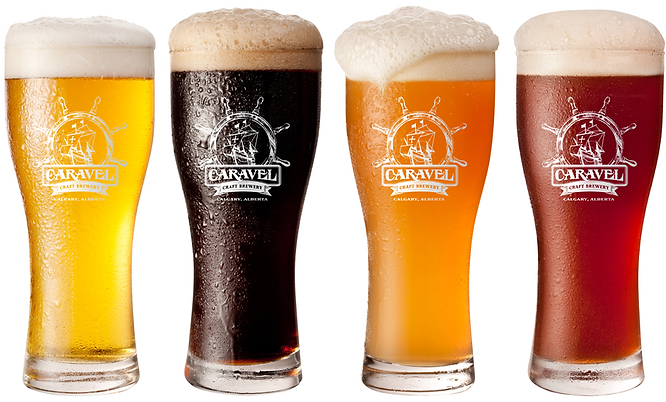 Caravel Craft Brewery gets its name from a specialty crafted ship, the Caravel, which was originally built for Portuguese explorers and eventually used by the Spanish in the 15th and 16th centuries. This ship was known for its ability to conquer headwinds with great ease and maneuver to previously unreachable regions of the globe. It is on this kind of ship that Canada was unexpectedly discovered in an attempt to reach India. This sense of exploration is what Caravel Craft Brewery is all about. Starting with Vlad, who explored new land in moving from Eastern Europe to Canada. With over twelve years of homebrewing experience, it was Vlad’s long-time dream to open a brewery. He found there was a need for freshly made, high quality, traditional beer in his newfound home city. He started Caravel with the goal of using old brewing traditions and methods to explore both forgotten styles and new tastes. Caravel is now a full team of passionate beer lovers whose enthusiasm is contagious to all. We pride ourselves in taking great care throughout the entire brewing process to provide a product our customers will love and remember. The brewery, located near the Calgary airport, boasts one of the largest taprooms in Calgary. The space is now a hub for both travellers and locals alike to come together over a well-crafted beer. Inspired by the haze observed on the sea while navigating the thrill of the unknown. The wheat malt and yeast are carefully selected to create a signature clove character and sophisticated tartness for an unforgettable taste. Travelling dead ahead will lead you to this Irish Red! Smooth and spirited with a touch of honey and roasted barley, this beer will enchant even the crustiest of crew with its clean finish and caramel tones. Join the Captain and set sail in search of this golden treasure that is sure to brighten the dreariest of days. Note the balance between the sweetness of the malt and the aromatic hops as they explore your taste buds. The Captain is sure to log this adventure, detailing your drinking experience with precision. This full flavored and stable beer has an unassuming taste that appeals to the masses and is smooth sailing right to the end. Don't be deceived by this beer's pale colour! This light lager is conditioned with dark roasted coffee that has undergone a 24-hour cold brew process creating a coffee beer that is surprisingly refreshing. This dark Munich lager both refreshes and satisfies the thirsty traveller with a medium body and a finish as smooth as the nighttime sea. A hint of sweet malt and toasty flavours are enough to intrigue any sailor and warm their spirits for the long journey ahead. This strong ale is sure to warm any aurora spectator as glittering notes of orange peel, coriander, clove, and cardamom flicker from the nose to the tongue. A medium body is paired with a light bitterness to end in a clean finish and refreshes observers for the spectacle ahead. Caravel's popular Hefeweizen gets the radler treatment for an orange-heavy beermosa style beer.